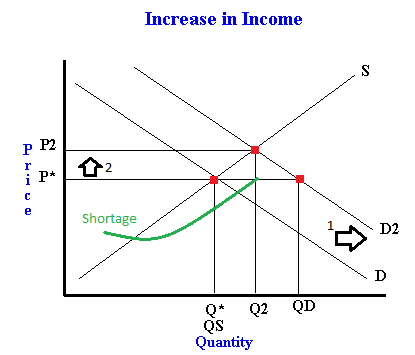 How a change in income changes demand and thus equilibrium price and quantity - FreeEconHelp.com, Learning Economics... Solved! For this economics example, let’s focus on the apartments for rent in the Calgary market. If we assume that this market is in equilibrium to begin with, then we can designate equilibrium price and quantity with P* and Q* respectively. Notice that in this market there is neither a shortage nor a surplus, the market is in equilibrium. For this example, I am also assuming that the good in question is a normal good, not inferior. Now if we have a change in people’s income --- the economy gets better or income tax goes down --- everything else equal we will see an increase in demand. Remember that an increase in demand results in a rightward shift of the demand curve. As soon as the demand curve shifts to the right, we are no longer in equilibrium at our current price and quantity (P* and Q*). You can see that there is a shortage in the apartments market. This means that the old equilibrium price is too low because there has been an increase in demand. Suppliers are willing to supply more apartments, but only if they are able to charge a higher price. Because of this, the price of apartments will rise until the quantity demand goes down a little bit, and the quantity supplied increases. Over time, we will see prices and quantities rise until we reach the point where the new demand curve crosses the original supply curve. This will result in a new equilibrium price and quantity that we can designate P2 and Q2, note that both have gone up as a result of an increase in income. We could do a similar analysis for the apartment market if income were to fall. Income could fall either due to a poor job market and wages going down, or possibly due to an income tax increase. If income were to fall, we would see a decrease in demand – everything else equal. 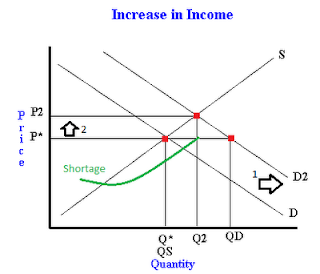 A decrease in demand would cause the demand curve to shift to the left. After this change in demand, there would be a surplus of apartments at the original equilibrium price. This would cause the price of apartments to fall, and slowly the quantity demanded of apartments would rise, and the quantity supplied of apartments would fall. Eventually the price would fall enough so that the quantity demanded of apartments would be equal to the quantity supplied of apartments, and there would neither be a surplus nor shortage.